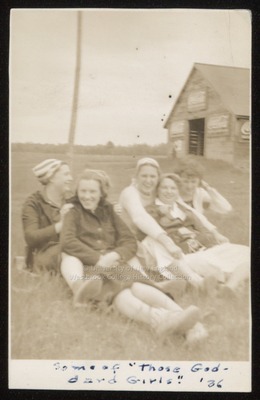 Five Westbrook Junior College students lounge in a field in this 1936 sepia toned candid snapshot with "Some of 'those Goddard Girls!' '36" written in blue ink on the front. On the back is written in blue ink: "Moore, Palmer, Cunningham, Craig & Gross." The young women wear skirts and sweaters, sneakers or tie shoes, and socks, and wide head bands covering most of their ears. They lay back in each others laps, facing at an angle.To the right of the rural field in which they lounge is a old barn covered in Coca-Cola signs.